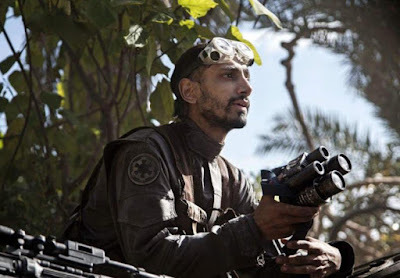 Riz Ahmed: "Rogue One Is About Waking up to the Real Political Situation of Your Time"
"Rogue One is about waking up to the real political situation of your time and accepting you can’t sleepwalk into the future because there won’t be one." "Bodhi is actually sanskrit for ‘awakening’. That’s what makes him so interesting. In Star Wars we have so many characters who are someone’s kid or grandkid and they are born into a legacy of greatness. Bodhi is just a guy who has to step up to the plate. He realises that he has to make choices and take risks that are way above his pay grade. It’s interesting to have a character amid this band of assassins, spies and soldiers that really doesn’t belong on a battlefield. It will make him quite a relatable character, I hope, someone who you can feel the PTSD coming from. He is bringing a lot of guilt to the table. I think he feels he has a lot of debts to settle. But that’s true for many of the characters in this film." There's no indication when this interview was conducted, so it seems unlikely that Ahmed is commenting directly on last Tuesday's events. However given his recent social media posts it seems likely he stands by his comments more than ever. Rogue One is the film the world needs and it's just 32 days away.